Class ended around 11:30 am yesterday, and I had time to kill until my final class at 3:30 pm. I decided to wander to the “Black Diamond” (also known as the Royal Library). On my way there, it began to rain, and of course I wasn’t prepared and was left without a raincoat or umbrella. (As a side note, I should probably always have some sort of rain gear with me at all times while in Denmark….you just never know when it might rain!) To avoid getting completely soaked, I took an alternative route through the vast hallways skirting the Christiansborg Palace. The site itself was immaculate, but soon I detected a friendly, familiar scent of hay and animals…there had to be some sort of stables nearby. But no that’s not possible here in the middle of central Copenhagen! The smell grew stronger and as I turned a corner, I encountered a large entry way, the sound of whinnying coming from within. My curiosity intensified and my hopes grew! 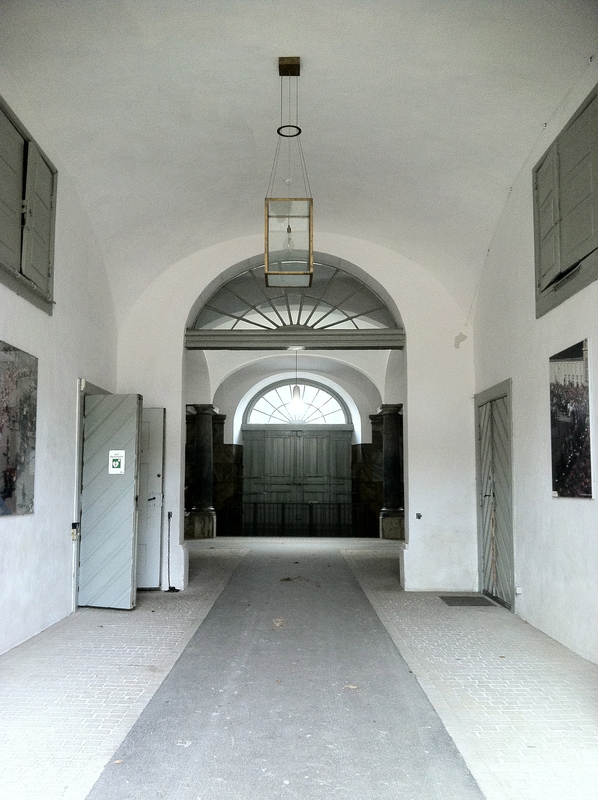 I silently crept into the entrance (as I wasn’t sure I was even allowed to be there) and discovered that I had just entered a magnificent horse barn. The walls were lined with stalls and in them resided beautiful white and flea-bit horses. They were some of the tallest horses I have seen, and they were all in such great condition. A woman who worked there noticed my interest in the horses and introduced me to one of her favorites. She informed me that these were the Queen’s royal horses and that she was responsible for training two of them. In fact, each trainer is assigned two horses to ride and drive every day. I was beyond ecstatic about this discovery. Being there with the horses gave me that comfortable feeling of home. I know for sure that I will visit my new friends quite frequently throughout the semester (especially now that I know that it’s welcome to visitors). Walking into the Royal Stables at the Christiansborg Palace. Christiansborg Royal Stables complete with large, open windows, marble columns, and 20 beautiful royal horses. 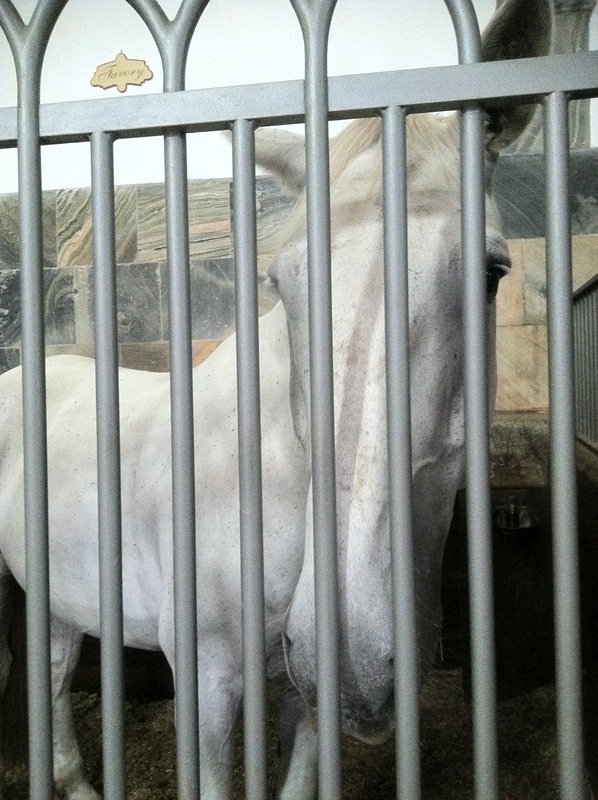 This is Flavory, one of the majestic Kladruber horses. Flavory mostly pulls carriages on ceremonial occasions but is also ridden sometimes as well. That is so cool! Love your posts 🙂 be safe! 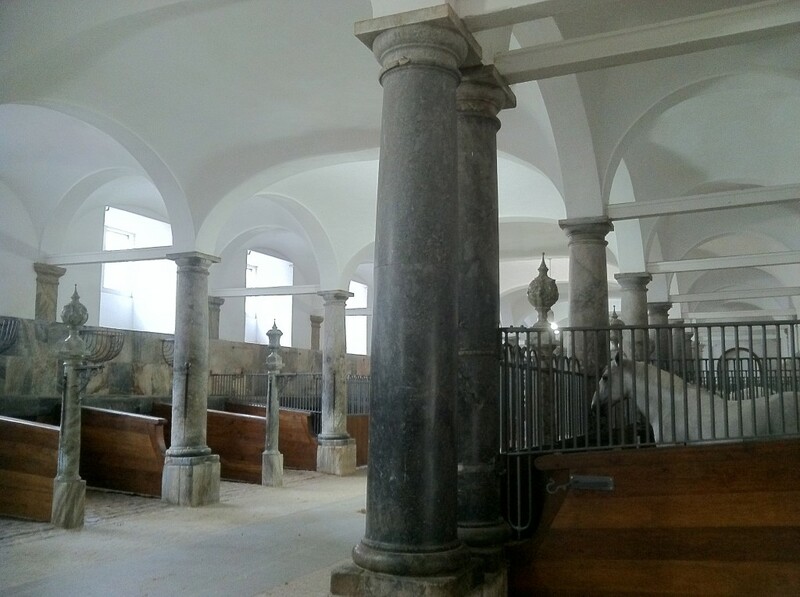 These are stables – WOW! A little birdie told me about your site recently so I will check in often. Love your adventures! Have fun, be safe! Lv ya! Quite an interesting adventure you had! Love the pictures as well. Also fantastically written, definitely was able to feel the experience you had of discovering the stable. Glad to see you’re having fun in Denmark!